Download the new European Climate Leadership Report 2017, Measuring the Metrics that Matter published in Bonn, Germany at COP23 by the NGO Energy for Humanity. 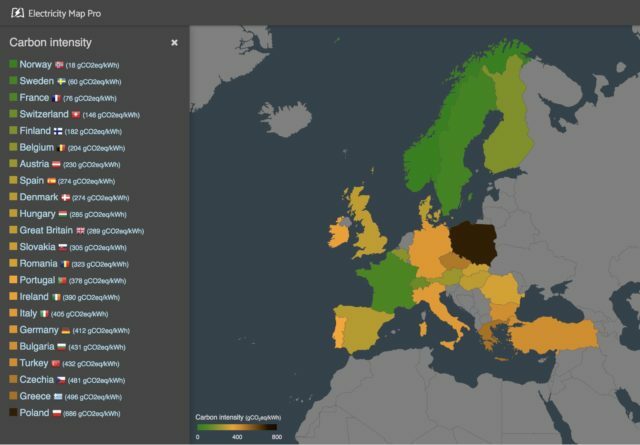 The new report ranks European countries on their climate leadership using official Eurostat data and exclusive data from ElectricityMap.org. Germany’s much-vaunted “Energiewende” programme has made things worse for the climate by shutting down carbon free nuclear capacity and locking in the dependency on coal burning for decades, despite hundreds of billions in investments and subsidy-schemes. In terms of absolute greenhouse gas emissions, Germany is by far the largest emitter in Europe (EU-28 plus EFTA plus Turkey). Germany alone emits 18 per cent of total emissions. Germany is not decarbonising as fast as other large emitters (14th of 23 countries analysed). Furthermore, by exporting electricity generated by fossil fuels, Germany is significantly increasing the CO2-intensity of neighbouring countries’ electricity consumption. Climate leaders are countries with hydro-power resources and strong policies to support nuclear energy, alongside renewables. These countries include Switzerland (hydro and nuclear), Norway (hydro) and Sweden (hydro and nuclear). In contrast, antinuclear Austria backs up its hydro capacity with fossil fuels, driving down its overall climate performance. Countries that have pragmatic yet ambitious climate and energy policies, such as the UK, are driving down their emissions. The UK has achieved the largest absolute reduction in GHG emissions in Europe from 2010-2015. Some Eastern Europe countries like Poland, Slovakia and Czech Republic, have also decreased their high emissions levels significantly in the recent years while growing their economies. For the first time, the data accounts for cross-border flows of carbon emissions. Importing dirty electricity impacts the carbon intensity of electricity consumption in some countries. The report strongly recommends that policy makers take imports and exports into account. A high percentage of installed new renewable capacity does not guarantee low CO2emissions. Climate leaders are countries that combine three elements: a low carbon intensity of electricity supply, a rapid reduction in their absolute level of emissions, and the maintenance of high levels of GDP. Countries which are leading the way in carbon emissions per GDP are those that have chosen to expand the provision of low-carbon electricity and those with good hydro-power resources. Countries with strong reliance on coal are in the bottom half of the climate leadership ranking. In terms of absolute emissions, the COP23 host Germany is actually a very poor performer. The decision to shut dow its nuclear plants prematurely means Germany has to keep its massive fleet of lignite and hard coal power plants on the grid far into the future. Germany is already failing its 2020 emission reduction targets, and there is currently no indication that it will do much better in the future. Far from advancing decarbonisation, the antinuclear “Energiewende” has locked Germany into long-term carbon dependency. On the other hand, the U.K. serves as a strong example where carbon reduction is mandated by law. Recent climate policy actions have started to work, and most recently the country has pledged to shut down its coal burning fleet by 2025; new coal plants can only be built if they are equipped with carbon capture and storage technology.